EcoTraining Blog: First EcoTraining Kenya Course is underway!! First EcoTraining Kenya Course is underway!! 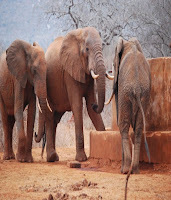 EcoTraining courses have started in Tsavo during such a symbolic and dramatically beautiful time! Tsavo is transitioning from a dry, dusty winter towards the promise of spring. The first signs of vibrant life are emerging from the most extreme drought in decades to offer a spectacle of green Commiphora shoots and Acacia blossoms which finely punctuate the red earth landscape. The dust covered elephants and long necked gerenuks are starting to find parcels of green shoots at the ends of the branches which should carry them through to the relief offered by the coming rains. Although we’ve previously trained guides in various parts of Kenya including the Masai Mara and Samburu, this is the first stand alone Kenya 28 day programme we’ve offered in the ilk of our popular South African course and I can say with excitement that our mission here is looking very positive. The potential from the change of season is wonderful. New beginnings are exciting and represent hope. The people attending this first Kenya EcoTraining 28 day course are a vibrant, fun loving bunch from five different countries including Kenya, Holland, Spain, the UK and Australia. The international and personal diversity are part of what makes our EcoTraining courses very worthwhile in terms of an interpersonal growth experience. After a short time, great friendships have formed and the group has molded into a team of motivated and informed wildlife warriors! Besides training professional guides for the Kenyan tourism industry it is very much in our philosophy to expose international nature lovers to in-depth sensory appreciation of our natural surroundings to further motivate conservation throughout the world. It is inspiring to see how a group of people from very different cultures, careers and ages all care so much about Mother Nature and how the knowledge and experience we are offering is furthering their focus and efforts towards each person being accountable towards ecological sustainability in our time.The natural biodiversity that we are encountering in Rukinga and Tsavo is impressive. 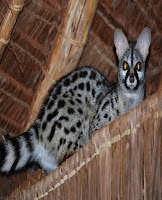 We have been fortunate to see 46 mammal species in the first two weeks including Lion, Leopard, Elephant, Buffalo, Striped Hyena, Spotted Hyena, Aardwolf, Grevy’s and Plains Zebra, Fringe Eared Oryx, Bat Eared Fox, Lesser Kudu and a Small Spotted Genet (that visits the camp). On our walks and drives we regularly encounter elephants and buffalo at the waterholes whereas the drier areas offer excellent bird viewing and landscapes, including a pair of Ostrich that are raising a clutch of chicken sized babies on one of the spectacular open plains areas. The Von der Decken Hornbills and D’anauds’ Barbets watch us cheerfully as we eat our meals each day in the open air dining area. The Tsavo / Rukinga system is currently dry but spectacular, there is a rare dynamic taking place as El Nino may show itself this year which could take the ecosystem from drought to green abundance in the next few weeks and months. It is these rare and dynamic changes that need to be witnessed in our time to allow us to connect with the magnificence of nature. It’s all happening in Tsavo, the rain clouds are starting to build … get here very soon to be a part of this!